In a bowl, cover the noodles with cold water and let stand until pliable, 25 minutes. Drain. Bring a saucepan of water to a boil. Add the noodles and cook, stirring, until al dente, 1 minute. Drain the noodles in a colander and return them to the pan. Fill the saucepan with cold water and swish the noodles around. Drain and swish the noodles 2 more times. Drain the noodles in the colander, lifting and tossing, until dry. In a small bowl, stir the grapefruit juice with the garlic, sugar and fish sauce until the sugar is dissolved. 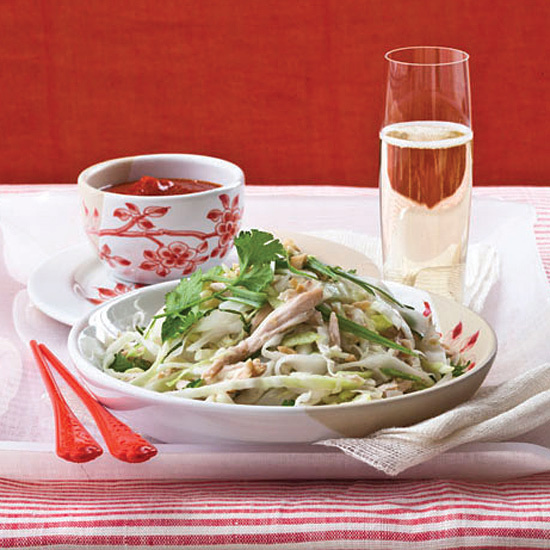 In a large bowl, toss the rice noodles with the shredded cabbage and scallions. Add the dressing and toss well. Add the chicken, cilantro and mint and toss. Serve right away, passing Sriracha sauce at the table.